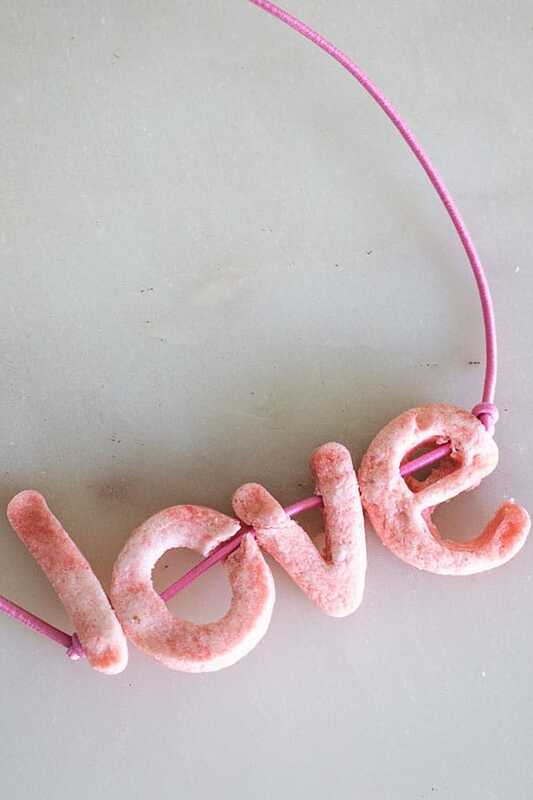 For years I have been meaning to make some salt dough letters with the kids. They are great to use in crafts as well as for learning activities. 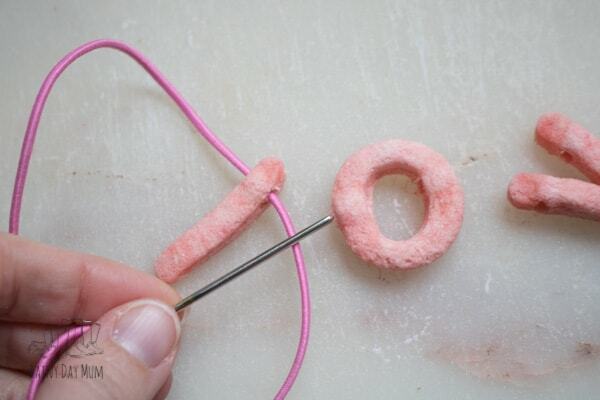 As we try and make things multi-use we created a set of salt dough letters that can be threaded like beads. 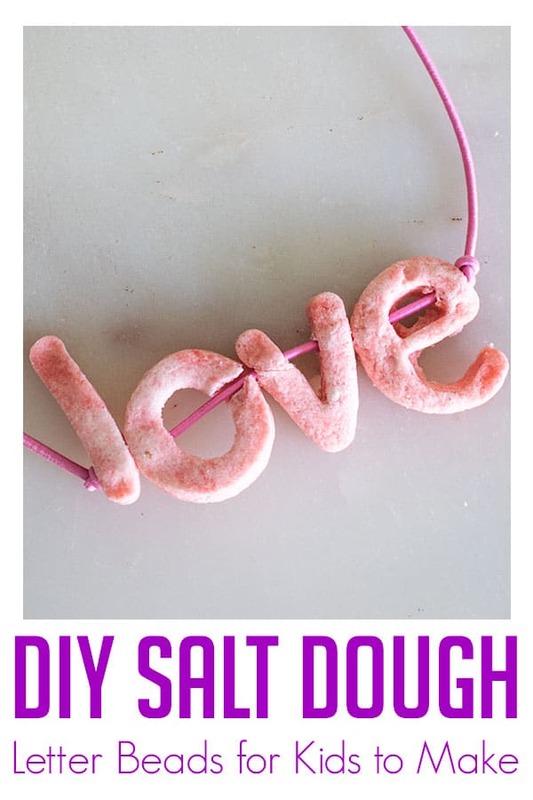 These are great to combine into words like LOVE which makes an ideal craft for kids to make for Valentine’s Day or Mother’s Day and works on fine motor skills as well as helping to spell. My daughter loved creating them and has made them into a LOVE necklace as well as used more of the letters in her spellings this week. 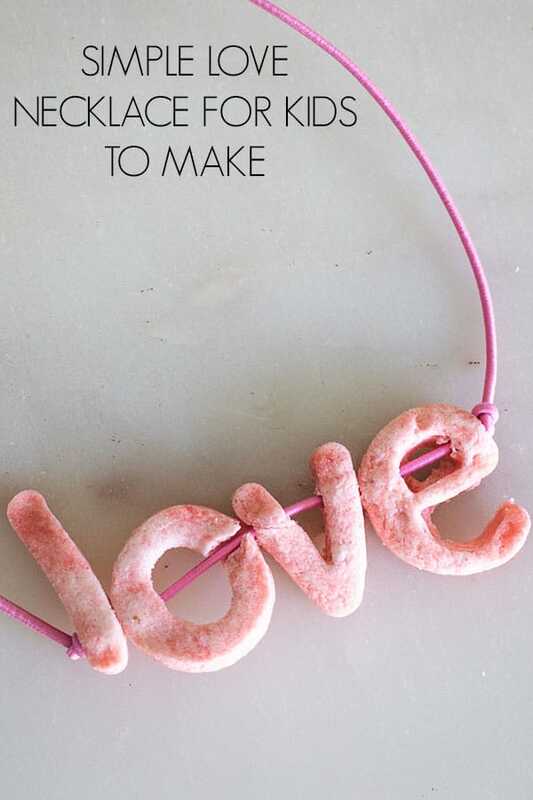 So here we go our How to Make Scented Salt Dough Letter Beads and use them with kids to create a simple LOVE necklace. 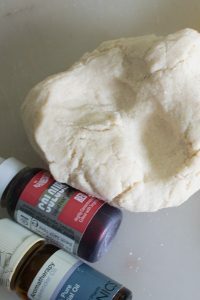 This recipe uses our microwave salt dough recipe which I had to come up with because my toddlers just couldn’t wait to decorate their Salt Dough Ornaments, but you could easily use a classic salt dough recipe just be aware that this will take longer to dry instead of around 30 seconds that this craft took my daughter and I. We use food colouring and some essential oils that we had around to colour and scent the mix. A simple recipe for lavender scented salt dough ideal for creating crafts and gifts that smell amazing. Place the salt and flour in a bowl and mix. Add the lavender to the water and stir. Pour the water into the flour and salt mix. Turn out onto a floured surface or pastry board and knead until smooth. This dough can be dried in the microwave, oven or air dried. You can use food colouring to colour before drying or paint afterwards. See our Salt Dough FAQ for more questions about using Salt Dough for crafts. We have included links to the products we used. If you purchase via the links we may earn a small commission on the sale. 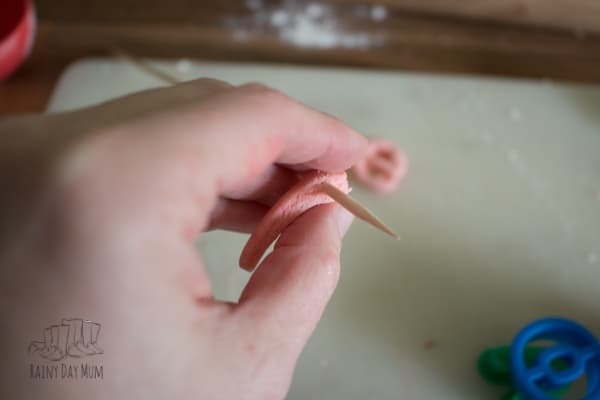 Split off a small portion of the salt dough. Add in 3 drops of red food colouring. Knead the colour in. We kept ours with a marbled look. Roll it out once combined to around 1/5cm thick. 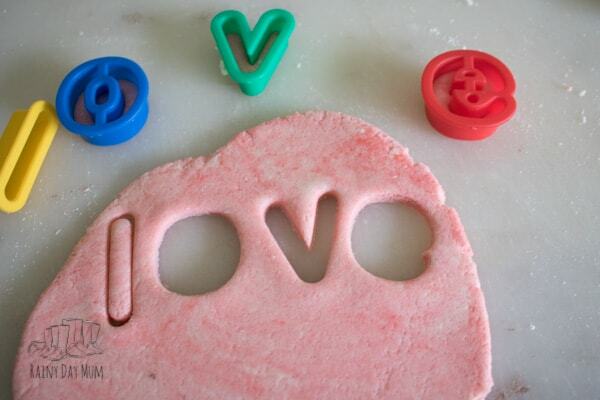 Cut out the letters L, O, V and E from the dough. 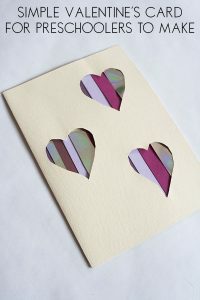 Take a skewer and in the side of each letter pass it through to make a hole. Cover a microwaveable plate with greaseproof paper and lay the letters on. Then follow the instructions for microwaving the salt dough very carefully. It will probably only take around 30 seconds for these small letters to dry in the microwave, however, if you blast them for longer than recommended you could end up with a microwave full of smoke! Once dry then thread some necklace elastic through the holes and tie off. You can add some beads to it as well. It can now be worn and not only does my daughter love it. But the lavender scent is also really calming and pleasant. 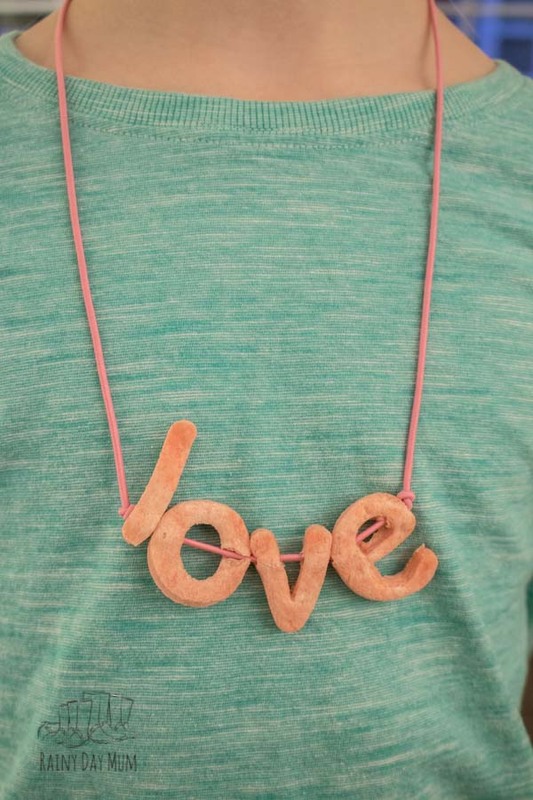 Top Tip -> Tie off either side of the LOVE letters and that way they won’t move around the necklace! 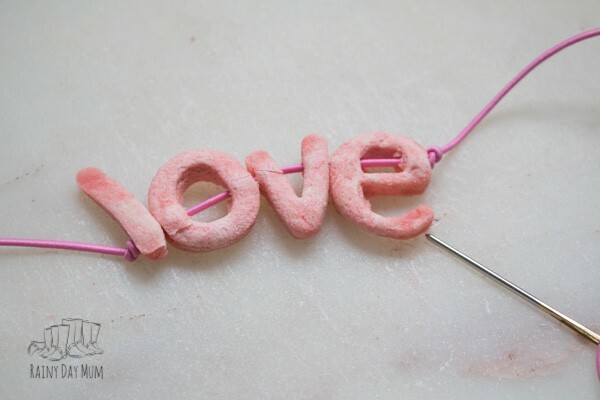 Have a go at this beginner needle felting project to make Needled Felted Hearts in a Cookie Cutter it’s so easy even the kids can make it too! 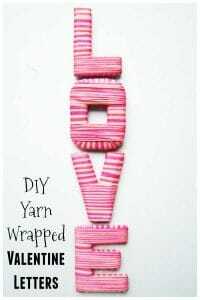 Make these Easy Yarn Wrapped LOVE letters for your home. My daughter has our set in her bedroom and loves them.